Say it again, I will get a big raise in 2017. If you are an employee now and are wondering about the feasibility of getting rich… you can do it. But it’s not going to happen if you’re getting just regular employee pay raises. Let’s start with some simple arithmetic. Joe Ordinary is 25 years old, makes $28,000 a year, and gets ordinary 3% to 4% yearly increases. Over a 40-year career, he earns around $2.3 million total. Sarah Superstar is not satisfied with ordinary. Even though she started at the same age and salary as Joe, Sarah works smart and averages a 6% increase in wages over the same 40-year period. By the time Sarah retires, she’s earned about $4.3 million. If Sarah doesn’t spend more as she makes more — or spends, let’s say, only half of it — she’ll be a millionaire when she retires, while Joe may well be broke. The point: Increasing your income — even by just slightly more than average — can make a giant difference over the course of a career. So imagine what’s going to happen when you do even better than that! Today, I want to talk about how you can get BIG salary increases — double, triple, or even quadruple what your peers get. Doing that will surely make you rich by the time you retire. Let me prove that to you. Businesses exist to make profits. As an employee of a business, it’s your job to perform a function that helps produce those profits. The more your work is seen as contributing to the company’s profits, the greater your salary is likely to be. Thus, salespeople generally make more than accountants and profit-center managers make more than engineers. In other words, if you want to get your boss to pay you more, you have to make yourself more valuable to him. So let’s talk about how you’re going to make that happen. First, I want you to set a goal for yourself to increase your salary by at least 10%. Setting a goal gives you both a starting point and a direction. It means taking yourself and your desires seriously. With a goal, you can see your successes and your failures — and learn from them. After that, make a list of all the ways you are currently valuable to your boss. Then make another list of things you can do to increase your value. That list will be a good source of ideas for you. Next month, for example, you might make it a point to get your boss his most important report a day earlier than normal. The month after that, you might tell him he can delegate to you the sales call he hates to make. As the months roll by, your boss will recognize that you are operating at a higher level. He may be surprised at first — even feel a little threatened, if you aren’t going about it diplomatically. But he will appreciate how you are making his work life easier and more productive. And he’ll begin to depend on you. Eventually — and this may happen in four months or it may take a year — he will see you as an entirely different and more important employee than any of the others he deals with. He will begin to think of you as indispensable. At that point, you will have no trouble getting an above-average raise. Maybe close to your goal of 10%. Or maybe much better than that. The key here is that the habits you have to develop now in order to get yourself that 10% raise will be the same habits that will help you double or triple your salary in the future. Superstar employees don’t do a hundred things better than ordinary, good employees. They usually do just a handful. 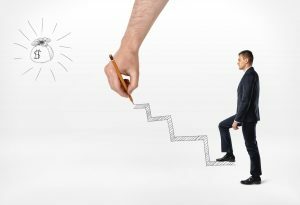 You’ll discover and perfect your handful next year in seeking to please your boss, and you’ll be able to use those new skills to go all the way to the top. Another caution: Sometimes, what you have to do to please your boss is not the best thing for the business. Some businesses — and this happens more often with larger, corporate businesses than with growing enterprises — become politically divided. In such businesses, it’s possible to get a job working for someone who cares more about himself and his own power than about the company’s future. If you have such a boss, you have to be a bit duplicitous. You have to do everything you can to please him. At the same time, you have to find a mentor at your boss’s level (or above) whose interests are aligned with those of the company. Work to please your mentor at the same time as you work to please your boss. By pleasing your boss, you’ll get your big raise next year. And by pleasing your mentor, you eventually will be able to abandon your boss’s rotten ship and secure a much better position. The greater your contribution to your company’s success, the higher the salary you can demand. And the best way to be a big contributor is to practice a financially valuable skill. There aren’t a whole lot of financially valuable business skills to choose from. Though it’s good to know how to analyze a spreadsheet or engineer a new design, if you want to make dramatically more money than you’re making now, you are almost certainly going to have to start doing at least one of the five things businesses traditionally pay big bucks for: selling, marketing, managing profits, creating saleable products/ideas, and buying right. Yes, I know you’ve heard it from me before. And, no, I won’t be angry with you if you decide to stick with what you already know. But I’ll point out again that, in going after the goal of increasing your income, you might consider changing your profession. It really will jet-propel your progress. 1. Make a resolution to be more valuable to your boss and/or your business. Do it now. Write it down. 3. Make a list of a dozen or so ways that you can increase your value to your boss and/or business. And pick at least one of them as your objective next month. Start with the goal of getting a 10% raise next year — and then aim for an increase of just half that amount for the next 10 or 15 years. The bumps you get from promotions can be considerably bigger… 25% or higher. Once you start climbing the ladder, your biggest opportunity will come from a move over to the money-making side of the business. If you do this, you can potentially get a percentage of the sales and/or profits you help create. That’s when increases can be 100%, 200%, or more. But as I said, the skills and work habits that will get you that first 10% raise are basically the same that will get you all the way to the top. So start with that 10% goal. And develop the habit of continuing to make yourself more valuable. Don’t brag, but do promote yourself. Then watch your income grow.